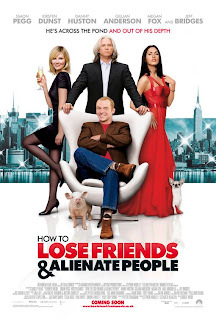 Based on the fantastically hilarious best-seller by Brit, Toby Young, the true-life story follows actor Simon Pegg as Toby (or a character based on Toby) during his comical, and often exciting tenure at Vanity Fair magazine in New York City. Social faux-pas were the norm, not the exception as he crashes industry parties and makes enemies of the most esteemed magazine and entertainment industry big-wigs. You can't help but cringe at his embarrassing exploits while at the same time, hoping that he does something *even better* to top his most recent mess. And what's the most appealing...the stories are true! Whether the film takes some artistic license, well we'll just have to wait and see. Toby's book was stellar so here's hoping that the movie lives up to the memoir. Circle October 3 and your calendar now and get set to laugh at someone else's misfortune! I love films with hopeless people having cringeworthy moments. I am the worst at getting round to seeing a moive, but I'll try and rent this when its out on dvd.